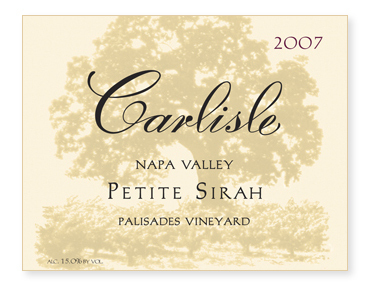 Not only is this our first vineyard designated Petite Sirah, it’s our first wine from Napa Valley! Believe it or not, there was a time, long before $100 Cabernet Sauvignons were commonplace, when Petite Sirah ruled Napa Valley, both in terms of demand and acreage planted. Today, only a handful of these original vineyards survive, mainly in the northern part of the valley near the town of Calistoga. But of these vineyards, certainly the Palisades Vineyard has to be considered one of the finest. We are extremely fortunate that the owners, Anne Carver and Denis Sutro, are willing to share their wonderful fruit with us.